The officers climbed on the altar and prevented the continuation of the Good Friday celebrations. Local official: "The Dalits have a church in their village." Christian leader: "Since Prime Minister Modi has come to power, attacks against minorities have increased." 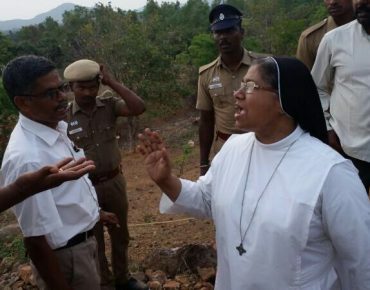 Chennai (AsiaNews) - On Good Friday the police of Tamil Nadu prevented hundreds of Dalit Christians from climbing a hill to make the Way of the Cross. The episode took place in Thirukazhukundram, famous for a temple dedicated to the god Shiva. Here on April 14 officers climbed on the altar (see video) and interrupted the celebrations. V.P. Jeyaseelan, the Chengalpet official, reports that the area had been declared "inaccessible" and that the incident was due to a long-running dispute between the residents and those of Sogandi Alagusamudram. Speaking to AsiaNews, Sajan K George, president of the Global Council of Indian Christians (GCIC) condemned the "sacrilegious attack. The sacrilegious behavior of radicals is unacceptable. We ask the National Commission for Human Rights to open a case against the police and the authorities have remained silent spectators of this reprehensible hate attack that wounded the feelings of hundreds of Christians ". The Jeyaseelan official explained that "Christian Sogandi Dalits had received permission to celebrate on the slopes of the mountain, but then the situation got worse when they have taken up the crosses and tried to climb the hill." He also reports that Dalits previously "had installed some statues, but we demolished them on December 31 after the Hindu Alagusamudram opposed them. We also organized two committees to bring peace, but this did not lead to friendly results. " Jeyaseelan adds that the Sogandi "Christians have a church in their village. They were warned that they should not violate the ban, but they claim to have a religious structure on top of the mountain for more than 10 years and should be given access. " Sajan K George complains that "India has long fought to protect religious minorities, despite the country declaring itself secular, democratic and pluralistic". On the contrary, there is "a climate of impunity. Since prime minister Narendra Modi came to power in 2014 religious-based incidents and sectarian violence have increased. " The minorities, he concludes, "are victims of forced conversions and 'Ghar Wapsi' policies [return to the homeland, namely Hinduism - ed] by Hindu nationalist groups such as the Rashtriya Swayamsevak Sangh (RSS)".